Long Beach, Calif. (AP) - The master of the retiring Queen Mary is saddened at "the end of this great vessel as a ship." "But what a magnificent building for Long Beach," said Captain J. Treasure Jones as the massive transoceanic liner was officially removed Monday from the list of the world's ships. The 62-year-old captain, retiring after being at sea since 15, watched with tear-filled eyes as the British Union Jack was lowered for the last time from the liner's main mast. In its place today fly the Stars and Stripes and the bear flag of California. The city of Long Beach bought the 31-year ocean veteran from Cunard Lines for $3,450,000 and plans to spend more than that to convert her into a floating hotel, convention center and maritime museum. Jones said that in England many "thought I was a bit of a traitor when I said I was delighted this ship was to come here to end her days." "The climate in Britain is not conducive for such a project and I am confident Long Beach will make a magnificent job of it and it will be a great success...I did not want to see her scrapped." "Some rain was falling from the sky, but there was far more coming down the cheeks of the British people who waved goodby [sic]." Some 200 persons watched the shipboard ceremony in which Jones handed the ship's registry--a small red book--to the registrar of the British Board of Trade. British and Long Beach attorneys then exchanged legal documents completing the sale. 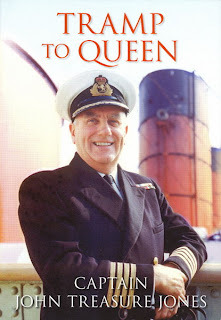 The captain said the Queen Mary--which he commanded for three years--carried more Americans than persons from any other country so it is fitting she retire in her "second home."